President Barack Obama on Tuesday went after Donald Trump and fellow Republicans in his sharpest rebuke yet of some of the policies floated by the presumptive GOP nominee. Obama spoke after a meeting with his national-security council, addressing the nation in the aftermath of the Orlando massacre — the deadliest mass shooting in US history. ISIS has claimed responsibility for the shooting, which was carried out by a 29-year-old man who officials have said became radicalized. “Would it make ISIL less committed to try and kill Americans? Would it bring in more allies? Is there a military strategy that is served by this? The answer is none of the above,” he continued. He labelled the constant insistence on using the term, which has been repeatedly pushed by Trump, a “political distraction.” Obama added that he’s been clear about how extremist organisations have “perverted” Islam. “If there’s anyone out there who thinks we’re confused about who our enemies are, that would come as a surprise to the thousands of terrorists we’ve taken off the battlefield,” he continued, taking a dig at Trump’s remarks from Monday, when the Manhattan businessman suggested Obama might have sympathy toward jihadists. Obama continued aiming at Trump, saying the implication that the government isn’t taking the fight against terrorism seriously would come as “a surprise” to the thousands of people, including military personnel, who are putting their lives at risk to combat terror groups such as ISIS. He added that it was also insulting toward intelligence and law-enforcement officials who work to defeat plots in order to keep citizens safe. “It has nothing to do with political correctness, and it has everything to do with defeating extremism,” he said of why he doesn’t use the phrase, adding that connecting all of Islam with terrorism is what organisations such as ISIS want. Obama shifted over to some of Trump’s policy points, and tore into his proposal to indefinitely bar all Muslims from entering the United States. 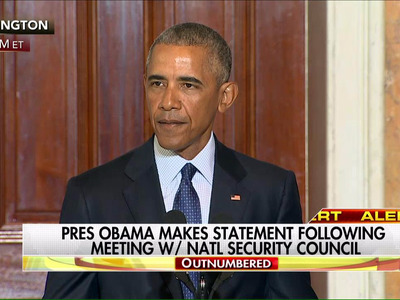 “Where does this stop?” Obama said, adding that Muslim attackers in the Ft. Hood, San Bernardino, and Orlando shootings were born in America.